CBS just released the new cast of Big Brother 16 today and now all the digging into all of the house guest pasts begins. This is the time when we get to know the house guests before they enter the house, its our first impression of them. Whether good or bad its human nature to make snap decisions about people from our first impressions of them. Not to worry though we’ll have 90 days of watching some of the new house guests creating new impressions of the cast as they battle it out for the half-million dollar grand prize. 11:20am – 11:30am Up in the HOH room – Andy, Elissa and Candice continue to talk about all the fights and drama last night. Candice thinks they Aaryn, Gina and Kaitlin did it for more air time. Andy tells Candice that they will get bad air time and you will get good air time. The conversation turns to talking about the competition last night. Andy and Candice talk about how happy they were when Jeremy was knocked out. Candice talks about her and Howard sleeping on the havenot floor. Elissa asks what they talked about. Candice says oh just about what happened and racism. Elissa says its just sad that stuff even happens any more. Candice agrees. Candice says all you do is talk about all of the drugs you have done in your twenty two years of life and you call me trashy? Candice says I work with children and you wear booty shorts to work. Elissa agrees. Elissa and Candice talk about hanging out after the season ends. 9:10am Big Brother switches the live feeds to the we’ll be right back screen to wake up the house guests. When the feeds return, Judd and Jessie are in the bathroom getting ready for the day. Judd talks about how he wants to go outside real bad. He says that’s my morning thing. Elissa joins them and talks about how she had the best sleep in the BB house last night as she has been in the havenot room before last night. Meanwhile Helen is awake in her HOH room. Elissa joins Helen in the HOH room. Helen tells Elissa that she can sleep up here whenever she wants. Helen says that she loves feeding the fish in the HOH room. All white fish and dark fish. They are all equal! Helen looks and that fish and says she doesn’t know what Aaryn was talking about all the fish are integrated. I guess she (Aaryn) see’s what she wants to see. Helen and Elissa talk about how happy they are that she won HOH. This is for all the people that have been mistreated. Helen says we can trust – Andy, McCrae, Judd, Amanda. And Candice you and I can trust her. 1:40am – 2am Andy is in the lounge room talking to McCrae and Amanda. Kaitlin knock on the door and asks if she can talk to him. Andy and Kaitlin head into the bathroom to talk. Kaitlin says that she wants to apologize again. Andy says okay, I would be pissed if I was in your shoes too. Kaitlin says that she isn’t mad, I am just heart broken. I would have rather you told me the truth. I have stood up for way too many people and I have stood up for the wrong people. I have way too big of a heart to be in this house. I have stuck up for you, Elissa, and Candice, awhile ago. It’s just hard because I give people way too much benefit of the doubt. I yelled at Judd and Jessie and I have apologized to both of them. Jessie wouldn’t accept it, that is her own issue to work out. Andy says that he really wavered with the decision and really started to like them this week but no one was giving me a guarantee. Andy says he likes Elissa and says with her here as MVP I would never go up. Kaitlin says that she gets it. Kaitlin says that she didn’t want to be a part of some of the other actions. Andy tells her that he knows she isn’t a bully but she has aligned with people that are. 11:35pm Spencer and Judd are in the storage room talking. Spencer asks Judd if he can put in a good word for him and to tell Helen that I am solid. Judd says yeah sure. Judd and Spencer shake hands. Spencer leaves the room. In the bedroom – Spencer asks Howard if he is okay. Howard says that he is good. Howard is moving his and Candice’s stuff out of the other bedroom. Spencer offers Howard his and Judd’s drawer. Howard and Spencer head into the havenot room. Howard is visibly upset and looks like he is about to lose it. Spencer asks what happened. Howard talks about how a lot of racial comments have been made and Candice feels like we are being weak by giving up our bed …which we are but.. if we stay in there I am going to lose my temper. Howard says that he can’t let that happen. Spencer offers Candice and Howard his bed and says that he will sleep in the havenot room. Howard says that its okay. 9:20pm – 9:35pm In the bedroom – Gina is talking to Kaitlin and Jeremy about missing Nick. Jeremy tells her that he tried to keep him here. Jessie tells Gina that is sorry about what happened. Gina flips out and tells her no you’re not you are responsible for what happened. She says that she doesn’t want to look her in the face when she lied to her. Jessie leaves and comes out the other bedroom and says that she just got yelled at by 4 people. Gina comes out and starts crying and going off on them. She says that she doesn’t respect someone who goes back on their word. Gina goes and points at each of them and tells them the nice things she has said about them or what she thinks of them. Gina then starts going on about how she and Nick had a connection that no one else saw. She says that they had a connection where they didn’t have to show everyone what they had. She tells that they can put her up if they want, I will play games and compete. Gina says good luck and to all of ya’ll and I will see you. 8:15pm – 8:30pm In the lounge room – McCrae, Amanda and Andy are talking about who to put up on the block. Amanda thinks they should put up Howard and Aaryn. Andy talks about how they were bullying Jessie in the kitchen right before the vote, how dumb is that!? Andy says thank god Helen got it! McCrae agrees and says that next week will probably be endurance and Helen probably wont be that good at it. Andy, McCrae and Amanda agree to keep the five (Helen, Elissa, McCrae, Amanda and Andy) of them safe and under wraps. McCrae says this couldn’t have been any better. Amanda says that she told Jeremy that this game isn’t all about winning challenges. That’s what you get for only watching one season. They talk about how they have 100% trust in each other. Andy says that Candice yelling and screaming at all of them, let her do it. Andy says that with Helen being HOH it is better that she has blood on her hands because she has a reason to go after them. 7pm The Big Brother Live Feeds return from being blocked during the Live Eviction Episode. In the havenot room – Andy, Candice, Jessie, Amanda, Helen, Howard, Spencer and Judd. Helen says someone was disloyal and I don’t like it. I will find out who that 8th vote wasn’t. Candice says they are cockroaches. Andy joins them and talks about how he is already receiving it. Jessie apparently said something to the others before the competition to make it look like she was on their side just in case they won the HOH. They call Jessie out on it and she says she is sorry and that she will go out there right now and tell them who’s side she is on. Andy tells Jessie that he knows she is with them and that it’s okay, he believes her. Helen and Elissa talk to Candice about how she can’t go off on them like that again. Candice says she is sorry. Helen says we treat people with respect. America will judge us. 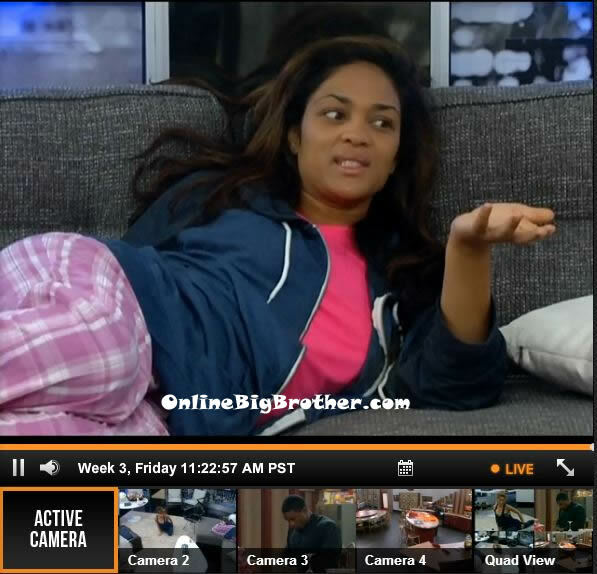 Helen says that Aaryn should never have put me up. I also want to know who the mole is, I want them to sweat a little too. Spencer want the vote to be unified so that everybody votes out Nick. This way they can rebuild trust with Amanda and Helen. McCrae says he was going to vote to Keep Nick no matter what but if the house flips his vote will be singled out. Amanda walks in and start complaining that they are talking without her. She says she’s getting worried. They ask her for one minutes alone.